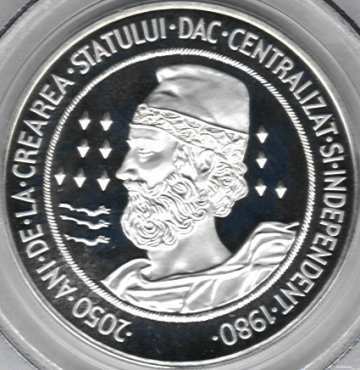 The other silver coin of the same series can be seen on the previous page. The silver pieces of the set have at the left (heraldic positioning) of the coat of arms an interesting ensign that looks somewhat like stylized F standing - maybe, therefore not sure - for the issuing Fraklin mint. So much information for now. Contact us if knowing more. A very peculiar information was provided to us by the anonymous donor of the pictures. 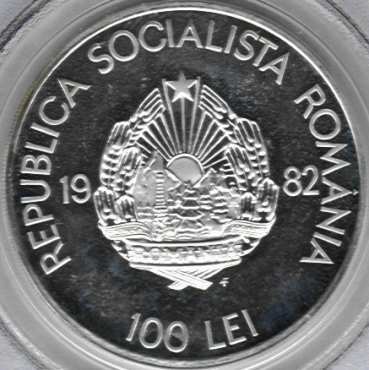 The 50 lei and 1000 lei coins from this series were only minted in 1983. They are a one year type. The 100 lei and 500 lei coins were minted in 1982 and 1983. 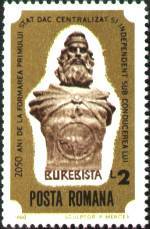 This would explain the year 1982 you see on the picture above (obverse). In some cases the 1982 coins were sold together as a set instead of individually. Moreover, there is another interesting bit of information about this series. Besides the regular 1983 coins, the Franklin Mint issued a special limited edition set (also 1983) with a serial number engraved on the side of each of the four coin. The Franklin mint only made 1000 of these limited edition sets. We could easily deem that not less than ten different pieces must be acquired to have an exhaustive collection.